Port-au-Prince is the poorest area on the entire Haitian island and is home to an orphanage called The Good Samaritan Orphanage. This orphanage was formed out of pure love and was started just after the great earthquake of January, 2010. The founder is a native leader named Vince. Coming home one evening, totally exhausted, after a long, hard day of helping with disaster victims, he was suddenly met by a young boy at his front gate. The boy proceeded to ask Vince for water and a small piece of bread. Vince although very tired was deeply moved and immediately invited the small child into his home. Vince then learned of the young boy’s predicament. He had told him of how his parents had been taken from him in the earthquake and how he had been living in the streets begging for food and water daily! He also told him of all the other children that were living in the streets and shrubs, with no food or water. He told him of how frightened they all were and how they would cry themselves to sleep at night not knowing what the next day would bring. This broke Vince’s heart and one by one the children began to come up to the same fence gate to find water and food and soon a loving home. Thus Good Samaritan Orphanage was born! 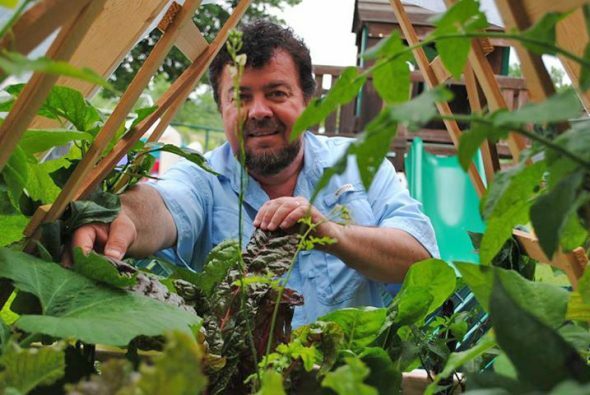 My name is John Musser, founder of Aquaponics and Earth Sustainable Living, Inc. I was invited to Haiti by key leaders to help in a large sustainability project. This project was to commence with a training center for sustainability for the entire Haitian island. I traveled from the southern tip to the far northern border of Haiti and then found myself at The Good Samaritan Orphanage. I fell in love with the children there! They sang songs as they greeted me, oh, how hard it was to keep back the tears. When I heard their stories of how they survived such odds, I vowed to help them. AESL so far has been able to help them expand their living quarters and shower area to eliminate the spreading of disease and sickness. However, I am strongly persuaded to implement sustainability in Haiti beginning with the first Cycle of Life Micro Farm at The Good Samaritan Orphanage, and then throughout the northern part of Haiti as well. Our objective is to first, build an entire AESL Cycle of Life Micro Farm in the back yard of the orphanage so that the children will have fresh fish and vegetables to eat, as well as, learn to farm the land for future sustainability! Although the system we will implement will be smaller, we see this project as a training center for other native leaders that could spread into northern Haiti and soon throughout the entire island. The children at The Good Samaritan Orphanage have already begun clearing the land, now it is up to us to finish the job! Funding is critical, partner with us to see this through! Sustainability is the hope of Haiti!